Required to take an Excel test as part of your interview process? Many employers want to ensure that you have the skills they need in Excel before they hire you. Outperform your competition and prove that you are the ideal candidate for the job by scoring high on your Excel assessment test. Excel assessments tests are a part of many companies' recruitment processes. It can be taken at any point during the process, with many candidates encountering an Excel test the same day as their interview. The point of the test is to examine your Excel skills as they are relevant to the job for which you are applying to. Read on to learn more about these tests and the types of questions on them. Click here for our CEB SHL style Excel test preparation. This pack is also suitable for Kenexa Prove It Excel tests. Excel is a large part of everyday office work, so it is very likely you will be asked to take an online Excel test as part of your application process. The Excel test can be structured as either a multiple choice test or one that uses interactive software to simulate the usage of Excel's interface. Though both types are available, the simulation test is more common. You'll be asked to complete a series of tasks on an Excel spreadsheet according to your level of expertise. Unlike working on the actual Excel software, these interfaces leave no room for errors, not all shortcuts are acceptable, and there can be no formula errors or spelling mistakes as most software offer no programme help. Furthermore, there is only one acceptable answer to questions that can usually be answered in more than one way. The multiple-choice test may be perceived as easier than the interactive test. However, it will force you to master the terminology and structure of the programme. Be certain of the test's location. While some companies will ask you to take the test at their offices, online tests taken from home are becoming more and more popular. If you plan to take the test online, prepare accordingly. Make sure you are in a quiet environment and that there will be no interruptions during the test. Though time is not always limited, it is being measured, and it will eventually influence your final score. Try to be as fast as you can whilst also maintaining accuracy. Scores are relative, so being good is not enough. You have to be better than others. Most testing companies provide tests for Excel 2010 and 2013. Though the differences are relatively minor, it is always preferred to practise the right version. Even if you have worked with Excel before, don't give up practising. The same task feels different when performed under the pressures of a test. Refresh your skills, become familiar with features you didn't use before, and master the ones you already know. The intermediate Excel test is usually used for applicants who must be able to work with Excel at a level higher than the most technical or basic. The advanced Excel skills test is aimed at applicants for jobs which require the use of Excel at its fullest capacity. 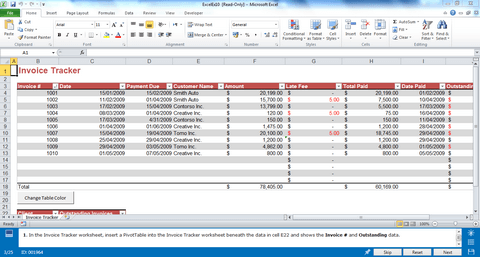 For example, accountants or other jobs for which Excel is used for financial calculations or managing large databases. Advanced formulas such as "if" and "concatenate"
Preparation ahead of any test is important to ensure you are calm and confident on test day. With JobTestPrep’s specially created Excel practice packs, you can familiarise yourself with the tasks you are likely to come up against on your test. Our pack is also designed to help you learn new skills that may appear on your test and that you might not be familiar with. The advanced level test is aimed for candidates who will manage a large amount of data and use the software at high capacity. It therefore requires a candidate to master the different features of the software. This doesn't mean you won't see any basic or intermediate questions on the advanced level test. They will, however, be the minority. Most of the questions will deal with formulas, macro creation, advanced formatting and document properties. Make sure to review the different topics so you will be as ready as you can. Here are some sample Excel test questions which could appear on an interactive test. In order to properly practice the following questions, copy and paste the chart below to a clean Excel worksheet - left click, hold and drag to mark the table, right click and choose "copy". 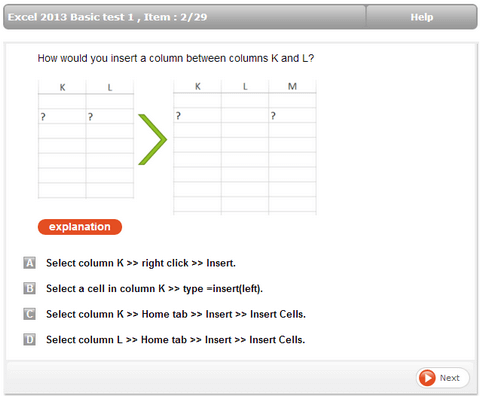 On the Excel worksheet choose the first cell on the left (A1), right click and choose paste. Make sure that the cell named A1 is indeed located at cell A1 on your worksheet.